Conny Golz is the first Huntingtonian Athlete of Month of the 2015-2016 school year. She earned the honors after garnering 70% of the 141 online votes. When sophomore Conny Golz first took to the tennis court as a kindergartner, she didn’t think the sport was for her. She said she begged her mom to let her quit, and she even took a year off. However, after practicing with her mom, she decided to pick up the sport again. “I just didn’t want to give up on it,” Golz said. That’s unusual determination for a five-year-old. Today, that focus and drive has landed Golz the number-one singles spot for the Foresters. The sophomore sensation has already found success during her first two seasons on the once unfamiliar asphalt courts. 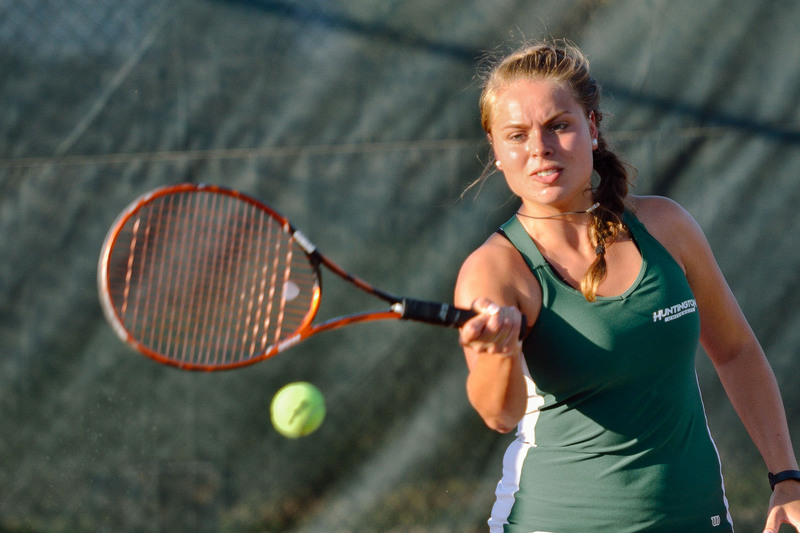 As a freshman, Golz remained undefeated, beating each of her 15 opponents, including all eight conference foes. This season, she nearly repeated the feat, finishing 13-2 on the singles circuit. She recently received all-conference honors for the 2015 season, just as she did in her first year. Golz hails from Friemar, Germany, where she grew up playing on clay courts. Throughout high school, Golz played on a local club tennis team, because German schools do not offer athletics. Golz said German universities do not offer sports either, which led her to the decision to study abroad. Golz filled out questionnaires to inquire at American schools, was offered scholarships by several universities and narrowed down her choices by e-mailing and Skyping her potential coaches and teammates. When she arrived at the university, she was forced to adjust to a different style of play. She said competing on clay is much slower than American asphalt, because the ball bounces slower and points usually end in longer rallies. Although it was initially a challenge, head coach Roger Ferguson said it has worked to Golz’s advantage after adjusting to asphalt courts for four week. Golz said that, growing up, she learned the simple philosophy of just playing the ball over the net and in the court. This mindset, she said, has helped her outlast opponents who choose to make aggressive plays early. Another change Golz encountered playing in America is the idea of school spirit. Since her high school didn’t offer athletics, this tie between school and tennis is new to her. “I think it’s so cool. It’s nice when other people support you, and they feel good if you support them,” she said. Golz also said her peers at the university seem to understand the rules of tennis more than her German peers — possibly from their ability to participate in the sport in high school. In the future, Ferguson said he sees Golz, as an upperclassman, stepping into more of a leadership position on the team. Currently, she is a sophomore on a team with multiple juniors. He stated that while “her skill and ability push her teammates to do better,” she hasn’t filled the role of a vocal leader yet. Ferguson is convinced Golz is on her way to reaching her full potential. Athlete of the Month is voted on by readers online. Conny Golz won in a near landslide, collecting more than 70% of the total votes.